I'm currently on the fifth stage of this trip depending on how you define things, it might actually be the sixth of seventh. In any case, I'm rather jet lagged! So here's the latest challenge in "Guess the location". The two pictures above are from the same town and actually the same park. 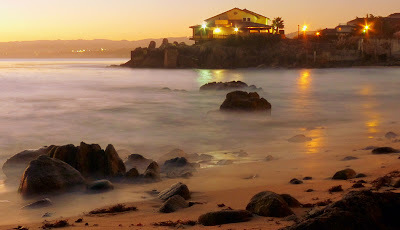 This is a predawn picture at my current location (which is absolutely lovely by the way!). Any guesses? I think this one is particularly tough! 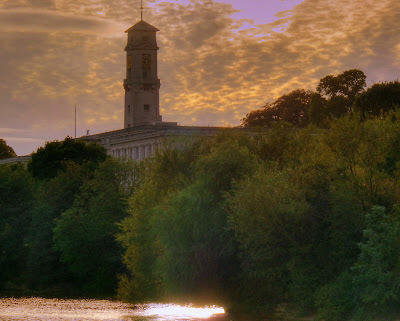 Incidentally, Ant had it pretty much spot on for my last spot, it was The University of Nottingham and a picture of the beautiful lake on the campus and the famous Trent Building. 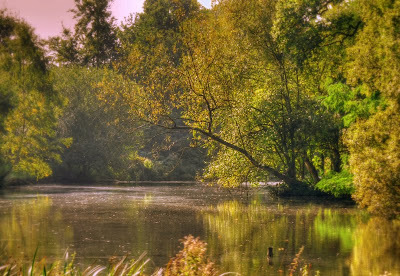 I'm about to leave for stage four of my trip having spent the last week or so in the English Midlands. Anyone guess from the pictures of this one landmark where I've been? I think it's a little less obvious than the last time! Or "Scrambling to read the meaning of the sky's most ancient flare". It's a story in which I played a minor role but it's an interesting read about scientific competitiveness and collaboration. "[...] Shortly after Tanvir received the alert, he was conversing via e-mail with his colleagues at the Joint Astronomy Centre (JAC) in Hilo, Hawaii, who had already started planning observations using the United Kingdom Infra-Red Telescope (UKIRT) near the summit of Mauna Kea. The good news was that night had only just begun in Hawaii—it was 10 p.m.—and the burst had gone off over the Pacific Ocean, which meant observations were possible. The bad news was that it was a windy night with gusts of up to 80 kilometers an hour blowing across the mountain. Opening the telescope's dome would subject the instrument to wobbling that would make it difficult to get any useful images. 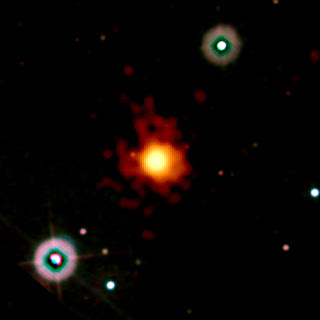 [...]"
A few months ago I wrote about the beginnings of the story here, here and here and now the paper is about to appear in Nature and is available via astro-ph - A glimpse of the end of the dark ages: the gamma-ray burst of April 23 2009 at redshift 8.3. I just received an email from a dear friend and colleague who is running a couple of half-marathons on behalf of the British Heart Foundation. 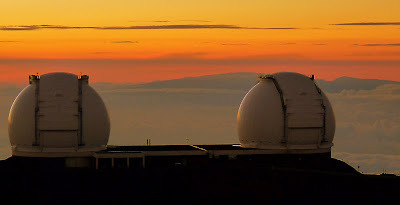 I know few of my readers are in the UK but please do consider sponsoring Derek Ward-Thompson if you read my blog and especially if you like the photos I post from the summit of Mauna Kea. Derek is the guy that got me into professional astronomy in the first place (I was on the way to becoming a secondary school teacher before his influence) and I owe him an awful lot. 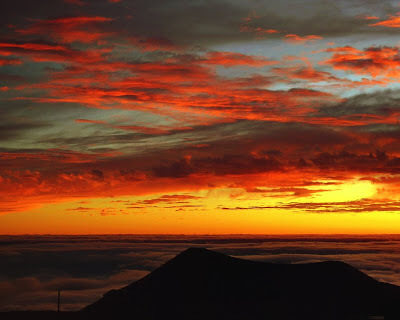 Think about it - you wouldn't see all those pictures of sunsets from Mauna Kea's summit if it wasn't for Derek! Derek has a significant physical handicap himself although if you are ever lucky enough to spend five minutes with him you wouldn't know it, the guy is very special and deserves all the support he can get, especially when raising money for others. So please donate, even if it's a tiny amount. If people don't donate then I just might ask Derek to sing some of his favourite beer-drinking songs and I'll post the videos on this blog. Please don't make me do that. I mean it. Please don't. 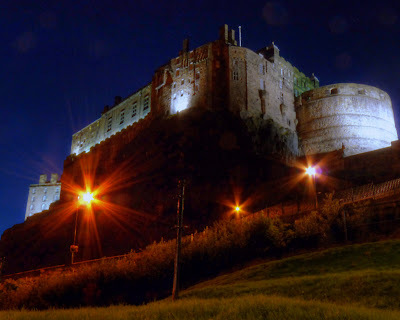 Some of you certainly recognized the landmark in my last blog post; it was Edinburgh Castle in Edinburgh, Scotland, a wonderful city (but avoid the chippys as one of them gave me food poisoning on the very fist evening I was here!). 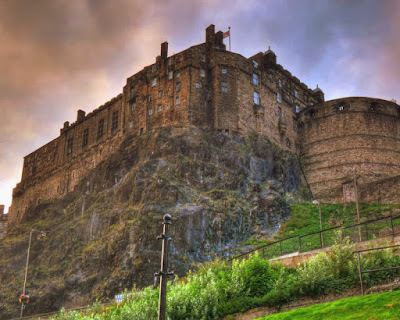 Although I've visited Edinburgh a number of times I've never actually stayed at one of the hotels in the Grassmarket and was surprised to get such a wonderful view from my room! I'm about to leave for stage three of this trip and have been pretty busy and very jet lagged so haven't had the chance to wander around taking photos, so just took a few quick ones tonight. 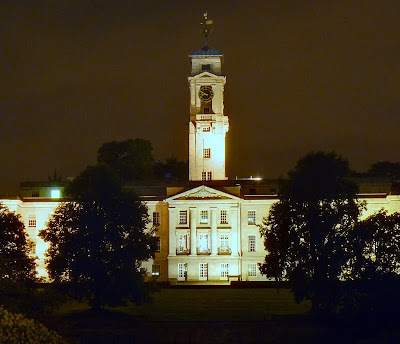 I'm hoping I'll be back here in the near future to work on a new and very exciting astronomical instrument but it depends very much on the funding situation in British science. 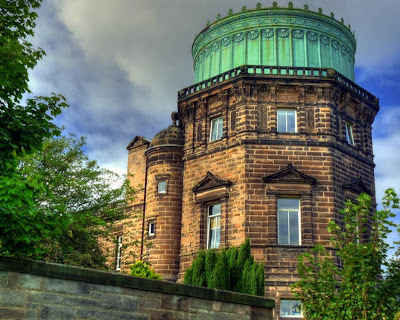 One of the old observatories at the Royal Observatory Edinburgh where I've spent the last three days. 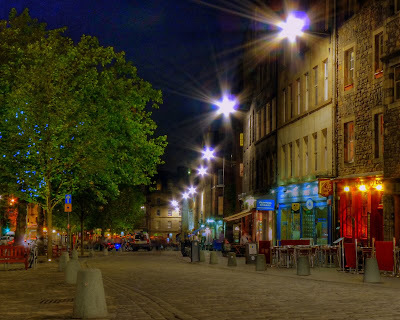 The Grassmarket in Edinburgh's city centre. Great pubs and restaurants but avoid fish and chips if you can but in any case I'm off to bed, I'm very tired and have an early start tomorrow. This is the evening view from the hotel room, although the picture(s) was actually taken outside in the early evening light. This is actually stop number 2 on the trip and some of you will know this landmark immediately and one or two know where I am anyway. In any case this city is one of my favourite places on the planet. In my usual spot close to UKIRT and after the sun has set. This was among the last set of pictures I took on this night a couple of weeks ago as the sky was clear and it was going to be a busy night. The silhouette of Haleakala, the dormant volcano on Maui, is in the background behind the twin Kecks. Incidentally, it's been pointed out to me, not for the first time, that many people may not realise that large versions of the pictures in my blog can be seen by simply clicking on the pictures themselves. One option is to simply add a caption to each image which says "click on this picture for a larger version" but I feel this starts to get monotonous and actually a little distracting. If anyone has a clever idea about how to make this obvious to readers without mentioning it with each picture or post I'd be interested in reading your opinion or suggestion. Thank you! Even from several miles away the cloud from Kilauea's lava outflow into the Pacific Ocean is visible. It's a poisonous and acidic steam plume that contains more than just water as some rather unfortunate visitors have found out in the past; they are no longer with us to tell their story. It's best to watch from a distance although you don't have to be quite this far away! 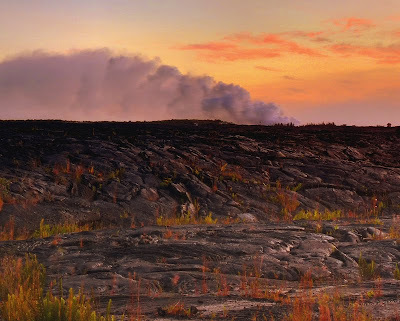 I was on the way back home after visiting Kalapana and it was getting dark but the volcanic plume and the red cirrus clouds looked beautiful, so I stopped to take a few pictures. This is actually a blend of a couple of long-exposure photos, one under-exposed to get the sky and plume and one over-exposed to catch the dark lava field. There are so many things in life that people describe as "hell". Obviously there are the really nasty things such as dealing with the loss of a loved one or losing a job. I'm talking about things on a somewhat lower level though. It's the 6-monthly task of taking the cats to the vet. Who would have thought they could draw so much blood? In the old days when they were young and inexperienced they just walked into the cat carrier, but now I have to plan ahead and trap them in a room with no hope of escape. Even then they try to escape. Perhaps my biggest mistake is using one cat carrier for two cats. I get one of them in there but have to open the door to get the other one in and that's when the fun starts and when the blood is drawn. The really bad news is that I'm going to have to do this again next week. They'll be taking a "country break" according to the brochure while I'm off on a trip. Yeah, right. I will admit, though, that the place that will be boarding them is superb - the Hilo Holiday Pet Hotel. The problem is that my cats don't think of this stay as a vacation and will do everything they can to avoid it. Last time I took them there I was close to requiring a blood transfusion - their claws are sharp. Well, the adventure at the vet is over and they seem even more attached to my home than ever, so I'm sure the violence will be even more intense next week. Who would of thought these two cats could be so vicious? Other than sunset and sunrise on the summit of Mauna Kea, the Puna coastline near Kalapana is my favourite spot on the Big Island. The jungle there always reminds me of the final Indiana Jones film, Kingdom of the Crystal Skull, in particular the scene with the dramatic chase in the jungle. In fact that part of the movie was filmed here but it was a few miles away from this tree tunnel in some privately owned land. There's another very beautiful tunnel a couple of miles north of this point which looks spectacular in the late afternoon sun as the ironwood trees filter the sunlight and mix it in with the more regular jungle-like trees. I really wanted to stop and take a few photographs but I was involved in my own car chase at the time - a couple of monster trucks behind me driven by local surfers who really wanted my car out of their way! Although the road is beautiful it's very narrow and windy, so didn't want to stop and get in their way. Oh well, I know the spot I want to photograph and will get another chance. 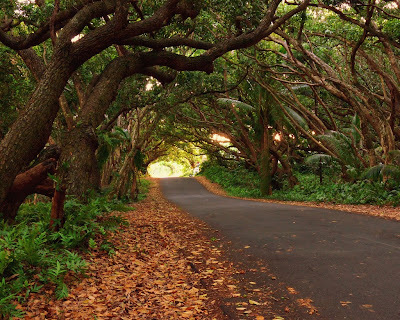 The tree tunnels are also very near Isaac Hale Beach Park in Pohoiki Bay, one of the most popular surf spots in East Hawaii. It's where I figured out on Sunday that I'm no sports photographer but I did have a lot of fun watching this guy paddle surf and catch the odd wave. He was very skillful. Not a shot I'm very proud of, but this guy was certainly having fun in the surf! I tried body boarding once on the west side of the island and only lasted four waves. I managed to catch one wave which was amazing fun for a few seconds but got wiped out by a following large wave which left me limping for weeks afterwards and I've never tried again! I have no idea how anyone can stay upright even in relatively small surf like this.